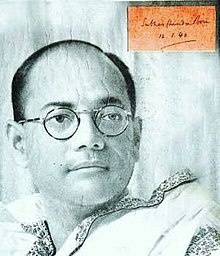 Bose organized a volunteer corps in uniform, its officers being even provided with steel-cut epaulettes ... his uniform was made by a firm of British tailors in Calcutta, Harman's. A telegram addressed to him as GOC was delivered to the British General in Fort William and was the subject of a good deal of malicious gossip in the (British Indian) press. Mahatma Gandhi being a sincere pacifist vowed to non-violence, did not like the strutting, clicking of boots, and saluting, and he afterwards described the Calcutta session of the Congress as a Bertram Mills circus, which caused a great deal of indignation among the Bengalis. কিছুদিন পাছতেই বসু পুনৰ আইন অমান্যৰ কাৰণে গ্ৰেপ্তাৰ হয় আৰু কাৰাগাৰলৈ যায়। এইবাৰ কাৰাগাৰৰপৰা ওলোৱাৰ পাছত তেওঁ ১৯৩০ চনত কলিকতাৰ মেয়ৰ নিৰ্বাচিত হয়। ১৯৩০ দশকৰ মধ্যভাগত বসুৱে ইউৰোপ ভ্ৰমণ কৰি বহু ভাৰতীয় ছাত্ৰ আৰু বেনিটো মুছোলিনিকে আদি কৰি বহুকেইজন ইউৰোপীয় ৰাজনীতিকক লগ কৰে। এই সময়তে তেওঁ গৱেষণা কৰি "দ্য ইণ্ডিয়ান ষ্ট্ৰাগ্‌ল" নামৰ গ্ৰন্থখনৰ প্ৰথম খণ্ড লিখি উলিয়ায়। এই খণ্ডত তেওঁ ১৯২০-১৯৩৪ চনৰ সময়ছোৱাৰ ভাৰতৰ স্বাধীনতা আন্দোলনৰ বিষয়ে লিখে। কিতাপখন লণ্ডনত ১৯৩৫ চনত প্ৰকাশ হৈ ওলায় যদিও বৃটিছ প্ৰশাসনে অৰাজক অৱস্থা সৃষ্টি হোৱাৰ ভয়ত নিজৰ উপনিৱেশত এই গ্ৰন্থখন নিষিদ্ধ ঘোষণা কৰে। ১৯৩৮ চনলৈ বসু এজন ৰাষ্ট্ৰীয় পৰ্যায়ৰ নেতালৈ পৰিগণিত হয় আৰু তেওঁ কংগ্ৰেছৰ সভাপতি পদৰ মনোনয়ন স্বীকাৰ কৰিবলৈ সন্মত হয়।. ↑ 1.0 1.1 1.2 Bayly & Harper 2007, পৃষ্ঠা. 2. ↑ 2.0 2.1 2.2 Hayes 2011, পৃষ্ঠা. 15. ↑ 3.0 3.1 Gordon 1990, পৃষ্ঠা. 344–345. ↑ Hayes 2011, পৃষ্ঠা. 165. ↑ Stein 2010, পৃষ্ঠা. 345. ↑ 6.0 6.1 Metcalf & Metcalf 2010, পৃষ্ঠা. 210. ↑ Gordon & 1990 pp459–460. ↑ Stein 2010, পৃষ্ঠা. 305,325. ↑ Low 2002, পৃষ্ঠা. 297. ↑ Low 2002, পৃষ্ঠা. 313. ↑ 11.0 11.1 Hayes 2011, পৃষ্ঠা. 65–67. ↑ Hayes 2011, পৃষ্ঠা. 152. ↑ Hayes 2011, পৃষ্ঠা. 76. ↑ Hayes 2011, পৃষ্ঠা. 87–88. ↑ Hayes 2011, পৃষ্ঠা. 114–116. ↑ 16.0 16.1 Hayes 2011, পৃষ্ঠা. 141–143. ↑ Bose 2005, পৃষ্ঠা. 255. ↑ 18.0 18.1 Low 1993, পৃষ্ঠা. 31–31. ↑ Wolpert 2000, পৃষ্ঠা. 339. ↑ McLynn 2011, পৃষ্ঠা. 295–296. ↑ Wolpert 2006, পৃষ্ঠা. 69. ↑ Bandyopādhyāẏa 2004, পৃষ্ঠা. 427. ↑ Bayly & Harper 2007, পৃষ্ঠা. 22. ↑ Wolpert 2000, পৃষ্ঠা. 339–340. ↑ 26.0 26.1 Bayly & Harper 2007, পৃষ্ঠা. 21. ↑ Moreman 2013, পৃষ্ঠা. 124–125. ↑ McLynn 2011, পৃষ্ঠা. 429. ↑ Allen 2012, পৃষ্ঠা. 179. ↑ Marshall J. Getz (2002). Subhas Chandra Bose: A Biography. McFarland. পৃষ্ঠা. 7–. ISBN 978-0-7864-1265-5. http://books.google.com/books?id=HdldV4Icum4C&pg=PA7। আহৰণ কৰা হৈছে: 13 June 2012. ↑ Yasmine Jesudasen. Voices of Freedom Movement. Sura Books. পৃষ্ঠা. 57–. ISBN 978-81-7478-555-8. http://books.google.com/books?id=4ifaLKBp5hEC&pg=PA57। আহৰণ কৰা হৈছে: 16 July 2012. ↑ V. S. Patil (1988). Subhas Chandra Bose, his contribution to Indian nationalism. Sterling Publishers. http://books.google.com/books?id=tkpuAAAAMAAJ। আহৰণ কৰা হৈছে: 16 July 2012. ↑ Mercado, Stephen C. (2002). The Shadow Warriors of Nakano: A History of the Imperial Japanese Army's Elite Intelligence School (illustrated সম্পাদনা). Potomac Books, Inc.. পৃষ্ঠা. 73. ISBN 978-1-57488-443-2. http://books.google.com.au/books?id=pLWvVEYVMScC&pg=PA73&lpg=PA73&dq=%22Only+on+the+soil+of+sacrifice+and+suffering+can+we+raise+our+national+edifice%22&source=bl&ots=JRNZc8sF2B&sig=twVh5bgzgtHJeObwIYI0AGc21yg&hl=en&sa=X&ei=rDOYUurqBZCclQX1xIHACQ&redir_esc=y#v=onepage&q=%22Only%20on%20the%20soil%20of%20sacrifice%20and%20suffering%20can%20we%20raise%20our%20national%20edifice%22&f=false। আহৰণ কৰা হৈছে: 29 November 2013. ↑ Eric A. Vas (19 May 2008). Subhas Chandra Bose: The Man and His Times. Lancer Publishers. পৃষ্ঠা. 27–. ISBN 978-81-7062-243-7. http://books.google.com/books?id=L5tIhE0P6IUC&pg=PA27। আহৰণ কৰা হৈছে: 16 July 2012. ↑ Hugh Toye (2007). Subhas Chandra Bose. Jaico Publishing House. ISBN 978-81-7224-401-9. http://books.google.com/books?id=E3cwAQAAIAAJ। আহৰণ কৰা হৈছে: 16 July 2012. ↑ Phani Bhusan Chakraborty; Brajendrakumāra Bhaṭṭācārya (1989). News behind newspapers: a study of the Indian press. Minerva Associates (Publications). ISBN 978-81-85195-16-2. http://books.google.com/books?id=M_xkAAAAMAAJ। আহৰণ কৰা হৈছে: 16 July 2012. ↑ Eric A. Vas (19 May 2008). Subhas Chandra Bose: The Man and His Times. Lancer Publishers. পৃষ্ঠা. 32–. ISBN 978-81-7062-243-7. http://books.google.com/books?id=L5tIhE0P6IUC&pg=PA32। আহৰণ কৰা হৈছে: 13 June 2012. ↑ Singh Vipul (1 September 2009). Longman History & Civics Icse 10. Pearson Education India. পৃষ্ঠা. 116–. ISBN 978-81-317-2042-4. http://books.google.com/books?id=RX4OiM0MGZUC&pg=PA116। আহৰণ কৰা হৈছে: 13 June 2012. ↑ 39.0 39.1 39.2 Gordon 1990, পৃষ্ঠা. 190. ↑ Singh Vipul (1 September 2009). Long man History & Civics Icse 10. Pearson Education India. পৃষ্ঠা. 116–. ISBN 978-81-317-2042-4. http://books.google.com/books?id=RX4OiM0MGZUC&pg=PA116। আহৰণ কৰা হৈছে: 16 July 2012. ↑ "The Indian Struggle". Hindustan Times. http://www.hindustantimes.com/news/specials/netaji/hisbooks_6.htm। আহৰণ কৰা হৈছে: 22 December 2013. ↑ Bose 2011, পৃষ্ঠা. 129–130. ↑ Bose 2011, পৃষ্ঠা. 127. ↑ Bhagwan Josh (1992). Struggle for hegemony in India, 1920–47: the colonial state, the left, and the national movement. 1934–41. Sage. ISBN 978-81-7036-295-1. http://books.google.com/books?id=phduAAAAMAAJ। আহৰণ কৰা হৈছে: 17 July 2012. ↑ Subhas Chandra Chattopadhyay (1989). Subhas Chandra Bose: man, mission, and means. Minerva Associates. http://books.google.com/books?id=AOdHAAAAMAAJ। আহৰণ কৰা হৈছে: 17 July 2012. ↑ Aditi Phadnis (2009). Business Standard Political Profiles of Cabals and Kings. Business Standard Books. পৃষ্ঠা. 185–. ISBN 978-81-905735-4-2. http://books.google.com/books?id=qT7QvviGoJsC&pg=PA185। আহৰণ কৰা হৈছে: 17 July 2012. ↑ K.S. Padhy. Indian Political Thought. PHI Learning Pvt. Ltd.. পৃষ্ঠা. 234–. ISBN 978-81-203-4305-4. http://books.google.com/books?id=jEz5soh9P3oC&pg=PA234। আহৰণ কৰা হৈছে: 17 July 2012. ↑ Durga Das Pvt. Ltd (1985). Eminent Indians who was who, 1900–1980, also annual diary of events. Durga Das Pvt. Ltd.. http://books.google.com/books?id=bLEZAAAAYAAJ। আহৰণ কৰা হৈছে: 13 June 2012.